Ian Presslie shares some pictures he took at Eastbourne on his instamatic back in the eighties. Philip Dalling reports from the recent social evening that reunited members of Long Eaton's National League winning side. 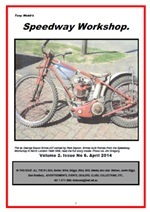 The latest edition of the Old Time Speedway Journal is now available. Tony Webb recalls his spell as a junior rider at Rye House and John Hyam writes on the mystery of Ron Johnson's two deaths. You can download your free copy from here. "I have to agree with Tracy. It hacks me off when people have a pop at Jerzy Szczakiel. 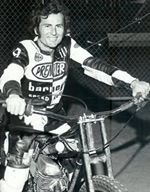 Anyone who knows anything about speedway will understand his history and that he was anything but a flash in the pan. You don't beat a world class field in two world finals by fluke and to even consider that to be possible is naiive at best. Further, when the greatest of them all, Ivan Mauger, says he was a class act, it's safe to say he was a class act. Ivan knows a thing or two about speedway." "I enjoyed reading about my old idol of the 50s, watched him race around the old West Ham track in Custom House many times. I still have some photos of Basse in a box in my loft, what treasures." "Garry Middleton. the posting by Bob Stanford was most interesting. As many readers would know I researched the life and times and published the book Garry Middleton Fact or Fiction in 2010. Garry's family helped me, Garry's eldest sister is a neighbor. What Bob has posted is in line with the family's version. the product was used sucessfully by Garrys mother for her Arhritus." "I have to agree with John Chaplin's comments about ill-informed presenters, Charlie Webster being the case in point. I have no issue with the presenter's gender - Julia Bradbury was excellent - but the lack of knowledge of the sport in Ms Webster's case is truly embarrassing. Even worse, she does not appear to be capable of learning on the job either. Also, can we please get rid of terms artificially imported from other sports -'Pit lane, paddock and straightaway' for example." Howie Zechner tells the story of a recent health scare for US rider and tv star Bill Gray. Details of a fascinating publication that will be of interest to those with an interest in the technical side of speedway. "Re: Philip Dalling's comments on the Sky presenters and interviewers. He doesn't mention how inept Charley 'Mumbles' Webster is. I have always queried the necessity for a woman in the pits, especially a woman who knows nothing about speedway. The football people would never send someone - male or female - who knew nothing about the sport or the personalities they were to interview. Sorry if this sounds chauvinistic, but unless someone knows what they are doing they shouldn't be there. It does the sport no good." "I had in my youth always wanted to see the massive 500 yard plus track and by chance in 2013, found myself on a train from Adelaide to Freemantle which went right past the Showground. Am curious to know if the railway was around when Peter's photo was taken." "I meet Garry in the early 80's. He had rented a room from my girlfriend at the time who lived in Northridge California. He had formed a Corp. called the Amerasia Corp. The Company imported a product called ADS which was sold for a number of ailments including cancer. As the Company grew and became more succesful he moved his opperation to Nevada where he set up a medical dispencery to treat people. When the AMA got wind of this they did what they could too shut him down by issueing warrents for his arrest. Garry and I became close friends and he lived with me for a short time. Before the trail Garry was able to talk his attorney Patrick Hillings Ex-Congressman to have his passport that was being held by the distric attorney releast. Shortly after Garry left for the UK and never returned too stand trail. I know this for a fact as I had invested in the corp. and was also listed in the law suit." 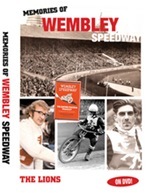 Our verdict on what you can expect on this new double-DVD that looks back on the great days of Wembley Speedway. 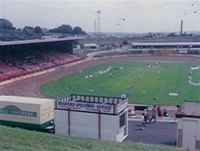 Stock Car fan Stuart Calvert has started a petition aimed at restoring motorsport to Odsal Stadium in Bradford. Thanks to all who have asked whether we'd be updating the Programme Generator to reflect the new Elite League race format. We've now added a new version that reflects the changes made, but the old version is still there for those Premier and National League fans out there. "Audrey Loak, the wife of Wally Loak, passed away peacefully, on Tuesday, March 4, 2014, at their home in Bedford. Wally is best known as the pioneer of audio speedway recordings. He started his work in that direction in 1964. I am sure our thoughts and prayers are with Wally Loak at this sad time. RIP Audrey Loak"
"Televised speedway is a challenge for any TV producer, camera people and the presenters. Sky league and Eurosport GP coverage is excellent. The camera work is especially first rate, it really does bring the sense of speed the daring and the skills of the riders to our screens. Where it needs a rethink is the time spent between the heats. Any supporter will tell you that part of the joy of our sport is the friendly banter that happens on the terrace between races so instead of just talking to the riders why not talk to the fans. Interview a few most will have something to say and will always make a comment on a good race. As a real treat what about inviting some veteran riders to give their views with even some clips from the old days. " "We're the NL serious about opening Plymouth, St Austell, Rayleigh or Leicester? All had closed in the preceding year, having been unable to make PL racing pay. Surely there was no possibility of any of them making a go of NL racing. I'm interested in Mike Parkers plans for amalgamation and equalization. Do you Have any details of his equalization proposals?" "Usually it was easy to predict where the big challengers were coming from but for many speedway followers, Jerzy Szczakiel's 1973 World Title victory was the biggest upset in the history of the sport. All I can say to that is, had anybody seen him at the World Pairs Final in Rybnik a couple of years earlier, when he and Andrzej Wyglenda were unstoppable, they would not have been quite so shell-shocked." "It is an unfortunate tag for a pleasant, unassuming man who not only was a whole lot better than that reputation suggests, but legitimately earned himself a place in the record books which hundreds of other supposedly better-credentialled riders never achieved." Arnie Gibbons continues the story of the 1963/64 close season, one of the most remarkable and pivotal ones the sport has ever seen. Peter Hunter shares a picture of the old Rowley Park circuit and adds some detail to explain what we can see in the photo. Gerry misses the White City stadium in London and has fond memories of a classic Brummies v Eagles encounter. "Thanks for the post Speedway Plus. We appreciate all the love and support from everyone." "Bruce was never a guy who liked needles when he got hurt. 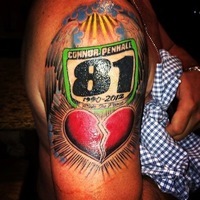 That is why this tattoo is so precious to the Penhall family and Connor. " "Have to admit that I was only going on reports I've read that while not naming the referee, did say he was Polish. I'm happy to stand corrected on that. Szczakiel did deserve to win on the day and didn't need help from the referee (while I do believe Zenon Plech was very fortunate to finish 3rd, that should have been Ole Olsen's). But that day just showed how any of the 16 riders could win the title on that single day. The Pole raced in Katowice like he never did before, or after for that matter. Take the World Team Cup final at Wembley just two weeks later. Last in his first ride, failed to finish his next two and was excluded for breaking the tapes in his 4th. He didn't even get to run his fifth race and as the new World Champion scored a grand total of zero points as Poland came in dead last. Not exactly what they would have expected considering they had the #1 and #3 in the World in the team." Pictures from Powderhall from the Edinburgh Monarchs v Long Eaton Invaders clash in 1986. These pictures are courtesy of Ray Davidson. Bruce Penhall recently braved the pain of the tattooist's needle. Here's the incredible piece of body art and the very sad story behind the tat. Pictures are courtesy of Ryan Penhall. The popular email message list 'Old Time Speedway' is now on Facebook. If you're "on facebook" then you can find their page here. "I have two tickets for Sept 7th 1939 for the South Grandstand priced 2/6 "
"The tune was Tokyo Melody by Helmut Zacharius." "To answer the query from 'Nige' re the music played at Hyde Road as the riders reached the tapes for the start, it depends on when he attended the stadium. But I suspect he would recognise 'Theme for the Common Man' which can be heard in various versions on You Tube. Also heard for some years at Hyde Road was the theme from the Olympic Games in Japan in 1964.....Helmut Zacharias' Tokyo Melody....again search You Tube for a rendition!" "If you mean the old march out tune It's called Blazeaway it's been recorded by many bands (brass & military } it was even played at Liverpool Cathedral at the memorial service for the late Peter Craven. I used to try and teach my mates in the pits Ken Eyre, Wilkie and Soren the rugby words to this great march." "An enjoyable and thought-provoking read. I too find Sky speedway coverage technically excellent and in general I believe the commentators/presenters are well informed and do a good job. Just two things really irritate me. I could well do without most of the interviews with riders. These can be embarrassingly awful, just as they are in football and other sports, due to a lack of articularcy and, increasingly, a language barrier. Secondly, the intelligence of the viewers is regularly insulted when the commentators rave about 'big crowds'. It is easy enough to focus a camera on a few hundred people huddled together in front of the main stand/clubhouse etc, but the shots of the actual racing cannot disguise the fact that the rest of the stadium is empty. "